Are you the one in the area, or the one commenting from the outside? Since you’re listening in, you must be a leader wanting to grow yourself and drastically improve health and safety along the way. Welcome to you, you’re in the right place. If this is your first time listening in, thanks for joining us and well done for trying something different to improve! And of course, welcome back to all of you wonderful regular listeners. This is a short reflection for you today. Last year, 2018, was in many ways a tough year for me. It was a year which challenged my commitment to the safety on tap mission, and to you. The details aren’t nearly as important as the way I approached this challenge which I want to share with you today because I think it will resonate with many of you, it is certainly not the first time I have faced this specific kind of challenge. On the day when I needed it the most, this quote popped up in one of my social feeds, and it couldn’t have been better timing. Have you ever felt like the mission you are on is just too hard? Too much trouble? Not making enough progress? I know lots of health and safety professionals who are genuinely battle-hardened in their roles, persevering in the face of plenty of challenge. Don’t get me wrong, when I was early career health and safety advisor, my own struggles with this were equally my own making vs the external factors like the business I was working in. I also know a sad number of health and safety professionals who don’t have issues with struggle, because they are not pushing hard enough, they are not leaning into their mission but just bobbing along in a job without much reflection on the connection between their work and the outcomes we apparently should strive for. I am not a big fan of pithy memes and throwaway motivational quotes, I feel like the world is full of them and yet things ain’t getting that much better. But for me, this one is different, which is why I wanted to share it with you. What I like about President Rosevelt’s words here, is that he focusses us on the importance of making the decision to be in the arena. 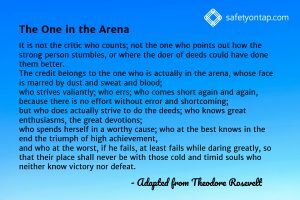 The arena represents what you stand for, the mission you are on. 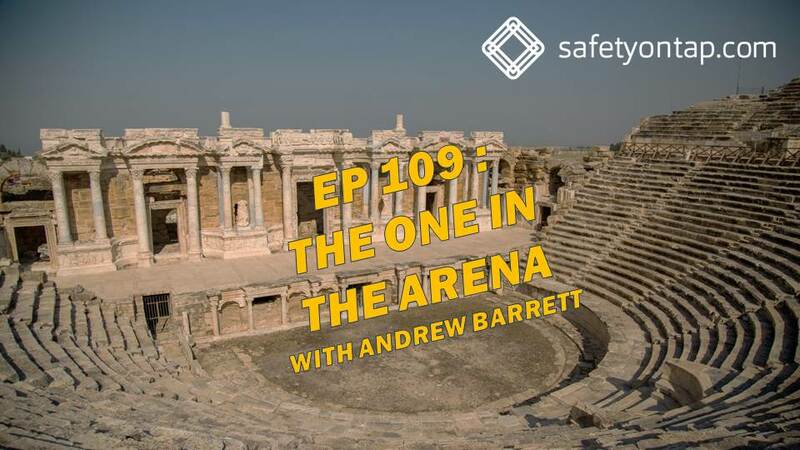 Your arena could be health and safety for an entire business if you are the head of health and safety. It could be a handful of work crews in your region as an advisor. It would be an entire State full of businesses and workers if you are a regulator, or an entire industry if you work at that level. It doesn’t matter. Teddy’s words are speaking to you. I’ve made a download if you want to have a written copy of this which you can get from the show notes over at safetyontap.com/ep109. I have this up in my office. This is probably the only time Safety on Tap will be doing a meme-style thing like this. I hope it’s a helpful reference. There are so many things about this speech which resonate with me, so many different insights. The statement that we will err, and come short again and again, reminds us success is not getting it right all the time but learning when we don’t, and to keep on going. The person who spends their time in a worthy cause – I think this is the ethical foundation of being a health and safety professional. And failing while daring greatly – taking a risk with who we are and the way we work, because it’s worth the chance of succeeding. I could go on, but I invite you to reflect on this and how it makes sense in your context. I’ve lost count the number of times I have read this, including out loud. I encourage you to read these words, out loud, to yourself. Just try it. And see what happens. My mission is to help leaders, like you, to grow yourself and drastically improve health and safety along the way. That’s my arena, and I am in it. What’s your arena, and are you in it? “It is not the critic who counts; not the one who points out how the strong person stumbles, or where the doer of deeds could have done them better. Another great episode. I love the phrase ‘leaning into the mission’, it instantly creates a picture that we should always be leaning forward, sometimes making headway at different speeds and sometimes standing still, but always leaning forward. Hope 2019 is a good year for you.